We live in interesting times with regard to human Mars exploration. I can’t remember a period in which the issue of humans-to-Mars has been so front and center, both in terms of significant progress being made with the actual Mars launch infrastructure, engineering and planning, as well as growing public discussion and excitement about the possibility of humans going to the Red Planet. Things are definitely happening, and the Mars Society is pleased to be an active leader in this historic endeavor. Elon Musk’s vision and leadership have electrified millions of people, not only in the U.S. but around the world, letting our global community see for the first time that humans to Mars is not just a down-the-line dream, but a goal that humanity can reach in the near term. The development of heavy lift capability to move equipment, supplies and most importantly large-scale infrastructure to the Martian surface is well underway, with a number of major aerospace companies, including SpaceX (Falcon Heavy), Boeing (SLS) and Blue Origin (New Glenn), leading the way. From news reporting and film production to academic studies and television advertising, the notion of humans-to-Mars is making serious inroads with the world-wide consciousness. The recent blockbuster film, The Martian, had a major impact on people and provided a realistic cinematic vision of how a human mission to the Red Planet could take place. This has now been followed up by National Geographic’s impressive MARS global event series, the second season of which will soon broadcast on television and online in many languages around the world. Mars surface simulation research and studies in Utah and Canada, including our ongoing Mars mission simulation at the Mars Desert Research Station (MDRS), expeditions to the Flashline Mars Arctic Research Station (FMARS) and the continuing expansion of the MDRS facility. Further development of our Rover Challenge Series, to multiple contests in many countries involving high school and university students. The Red Eagle student engineering contest to eliminate a key tall pole for human Mars exploration by designing a lander capable of delivering 10 tons to the Martian surface. Public outreach and educational programming, including promotion of STEM studies through several new projects. With the involvement of our growing Mars Society advocacy network, we look forward to working with the new NASA administrator in helping shape the future of the U.S. human space program and encourage a dramatic acceleration of the nation’s drive for Mars. People are talking about the prospects for a human mission to Mars: not just the usual suspects, but also entrepreneurs and many more who have finally realized that humanity’s future in space, beginning with a permanent human presence on Mars, is now within reach. This needs to be organized to produce concrete results. That is why it is so important we continue to build on the work of the Mars Society in insisting that the initiation of human exploration of the Red Planet be made a true national goal – not just a dream for the future, but as a grand achievement for our time. But we cannot do this without your help. Please join us in the fight for America’s goal to send humans to Mars. Support the Mars Society by visiting our web site to make as generous a contribution as you can. I thank you for your continuing support and involvement. 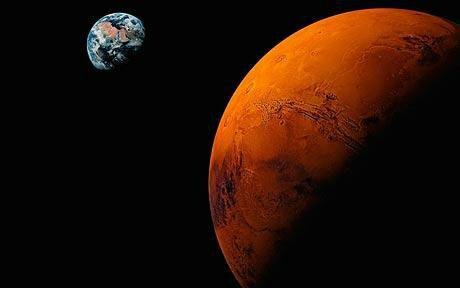 Together, we can make it a prosperous new year for Mars!